no. 28/2008 on p. 86. NK 920 The Immaculate Heart of Mary as earrings sold by Bella Donna in 2013. Display of devotional instruments or objects may testify to the beliefs or the piety of someone. 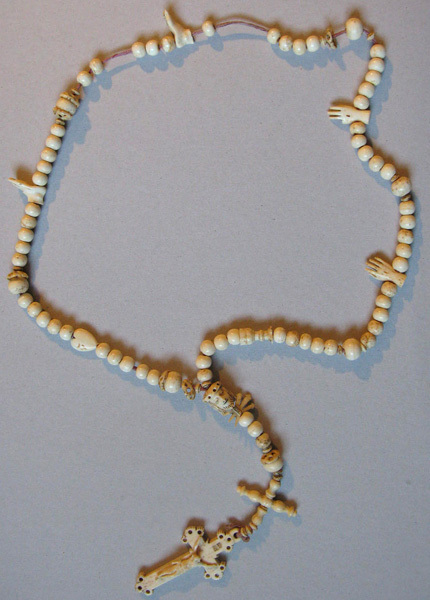 When large elaborate rosaries almost became part of the Bavarian national dress for women, this obviously echoed a long and pious Catholic tradition, yet wearing such a rosary ceased to reflect the piety of that particular person. It became customary, part of the standard equipment belonging to the costume. Having become tradition in this sense, the rosary may be worn to complete the national dress rather than making a religious statement. Shortly after the turn of the millennium, rosaries actually became part of a modern, fashionable repertoire of accessories. In September 2008 one could read in the Norwegian fashion magazine Costume, as the Fall collection of Givenchy was presented, that: “The large pieces of jewellery with religious references and high-heeled leather shoes with high lustre completes the look”. Young models were seen wearing rosaries around their necks, and in several advertisements a young man, naked to the waist, displayed across in a chain around his neck, the cross being a small-sized version of the familiar cross on the pastoral staff of Pope John Paul II. 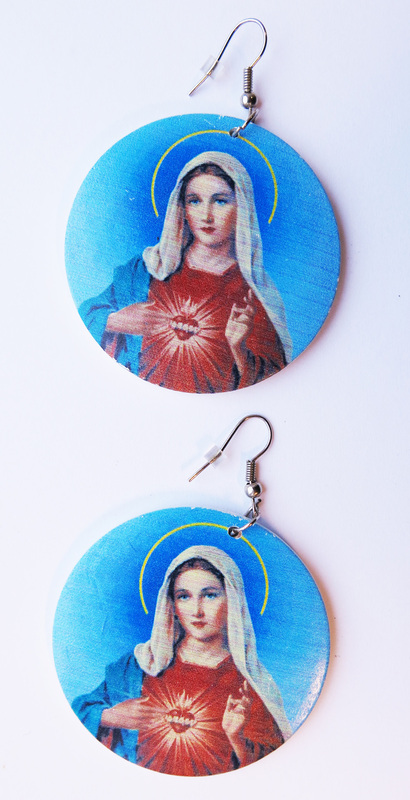 An in December 2013, one might purchase a pair of earrings in a store belonging to the chain called ‘Bella Donna’, each disk showing a depiction of the devotion motif of the Immaculate Heart of Mary. Indeed, religious references and devotional accessories have been “in” for some time. Likewise, current interior decoration presents items which formerly belonged to the group labelled “religious kitsch”: older plaster or china figures of Madonnas, saints, Sacred Heart statues, or the ubiquitous angels appearing in all shapes and forms. Apparently, these figurines represent a nostalgic quality sought after in a modern and difficult world. “This”, the owner of an impressing home may say with enthusiasm when interviewed by a magazine on interior decoration, “I found on a flee market in Italy”. In the same way religious medals appeared in a rather unexpected place in 2007. On the booklet which accompanied Bruce Springsteen’s CD “Magic”, published in October 2007, the front shows a close-up of Springsteen’s chest visible behind an open shirt. 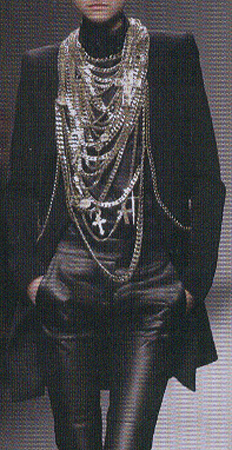 Around the neck he wears three chains with a total of five religious medals. It is impossible to discern what the top medal depicts since it is small and covered by the chains; in addition the light reflects from its surface. The next medal with its rounded top is equally difficult to identify due to the reflection of light; yet one might suggest The Virgin Mary with the infant Christ. The three bottom medals, however, are possible to identify: From one chain hangs the oval ‘Miraculous medal’, the medal promoted by the Church according to a vision by the French nun, Catherine Labouré, in 1830. It served the propagation of the Immaculate Conception which was, then, declared a dogma by Pope Pius IX in 1854. Far less visible, a rectangular medal with a female saint hangs to the right from the same chain. It might be a medal of Saint Catherine Labouré, shown in profile and with a halo. Saint Catherine was canonized in 1947. At the bottom, in another chain, hangs a St. Christopher medal with the inscription: ‘St. Christopher. Pray for us’. For a musician who is regularly on tour, a medal of St. Christopher, protector of travellers, would be an appropriate medal to carry around the neck. This somewhat surprising display of ordinary, cheap religious medals on a superstar’s chest may be accessories chosen at random to obtain some effect – perhaps referring to the title of the CD. Of course, basically, we cannot know why he let himself be photographed in this way. Playing with elements of Catholic religiosity and religious symbolism had already been a prominent feature in the public life of the singer Madonna (Ciccone) as well. Accordingly, her first greatest hits compilation album from 1990 was titled “Immaculate collection”. 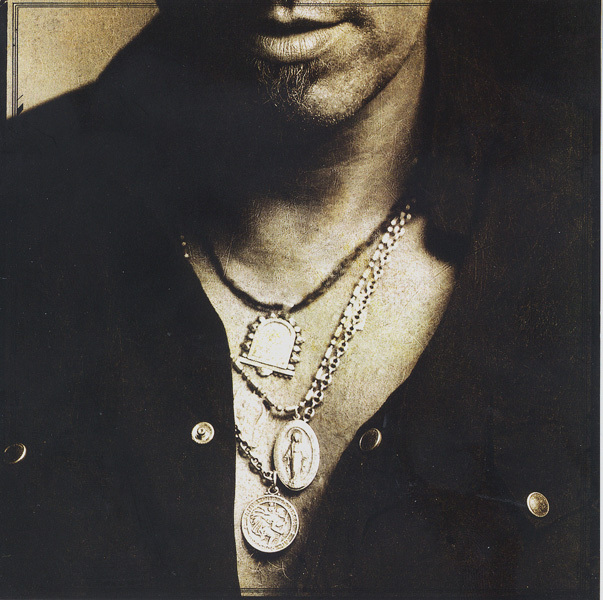 The religious medals worn by Springsteen might, then, reflect the fact that he too was born and raised a Catholic. A child of a mother of Italian ancestry and with a father of Irish/Dutch ancestry, he attended the local Catholic parochial school until the ninth grade. So, the cheap medals may have been chosen to articulate his roots at a point in time where religious symbolism of Catholic descent had been introduced as exotic and deep, and when its accessories were already perfectly fashionable.